Hearing millionaire footballers insist that they would play for nothing has become difficult to swallow for many fans. But for one player - AC Milan and United States defender Oguchi Onyewu - at least, it's been more than empty rhetoric. The 28-year-old offered to play for the Italian giants for free after spending almost the whole season sidelined with injury since joining from Standard Liege in the summer. 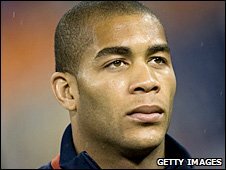 Onyewu, who had a loan spell at Newcastle in 2007, made only one appearance for Milan before rupturing the patellar tendon in his left knee during a World Cup qualifier against Costa Rica. Having effectively been unable to play for a year of his three-year deal, which was due to end in 2012, Onyewu negotiated a one-year contract extension and told the club he did not want a salary during his final year. The American, who has recovered from his injury and is part of his country's World Cup squad, will now remain at the San Siro until the end of June 2013. A club statement read: "Onyewu - who has been out for virtually the whole season due to injury, but who at this time is getting ready to face the World Cup adventure in South Africa with his national team - has become a star today with a significant gesture from a personal and professional standpoint. "Onyewu has requested and obtained a contract extension from June 30, 2012 until June 30, 2013. "With respect to that year, as was his wish, which has been appreciated by the club, Onyewu has asked not to receive any type of wages. "This is an exemplary gesture that deserves our sincere congratulations."